Alice Springs has a new range of innovative and tourist-friendly signs popping up around town with the launch of the Sustainable Science Trail. The Sustainable Science Trail uses smartphone technology to give visitors an extended or interactive experience at participating locations around Alice Springs. “By pressing a button on your smartphone a list of nearby sites appear on the screen – and visitors can learn more about a particular point of significance – or even contribute data to a survey or quiz. It’s easy and fun – and adds a new dimension to the experience we can offer our visitors”, says Scott Pullyblank, Director of Life Sciences, Alice Springs Desert Park. A working group of local organisations have developed a range of interactive experiences and will be monitoring participation and the results over the next six months. The five initial sites that are part of the Sustainable Science Trail are: Alice Springs Desert Park; Olive Pink Botanic Garden; Desert Knowledge Solar Centre; Alice Springs Community Garden and Adelaide House. “The technology that we are working with is quite new. GPS is great but it isn’t always accurate and it can’t be used indoors. So we are working with a new app called Sites and Trails NT which uses proximity beacons to pinpoint exhibits or points of interest precisely” says Edan Baxter of technical solutions company, Spinifex Valley. “Adelaide House is a site of incredible heritage value – not just to Alice Springs, but to Australia. We are hoping that this technology will help us get visiting school students through the door to learn about some of the great scientific innovations that have come out of Central Australia”, says Steve Bevis of the Uniting Church. “Alice Springs is a world class destination for its natural environment– so why not showcase local innovation and sustainability initiatives too?” says Jimmy Cocking, Director of the Arid Lands Environment Centre and working group member. The working group is presently seeking expressions of interest from other local organisations who are interested in trialling and extending this new technology further. The working group acknowledges the support of Inspiring Australia and the Australian Government who provided the seed funding for this initiative. 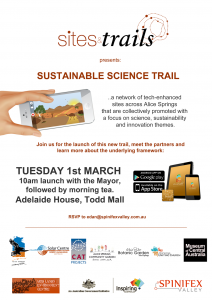 The Sustainable Science Trail will be launched at Adelaide House on March 1st at 10:00 am. A seminar on “Tourism & Technology” will follow at Central Australia Development Office (Marron Room) at 11:00am. Sustainable Science Trail sites are listed online via www.siteandtrails.com.au. Interactive activities can be accessed by download the “Sites and Trails NT” app on the AppStore or Playstore.